Fall is well underway...How did Dublin Real Estate Perform this Summer? You are here: Home / Blog / Fall is well underway…How did Dublin Real Estate Perform this Summer? Fall is well underway…How did Dublin Real Estate Perform this Summer? Well Fall officially began on September 22nd this year. Things have certainly turned colder and wetter in our part of the Bay Area but Real Estate is still moving fast. 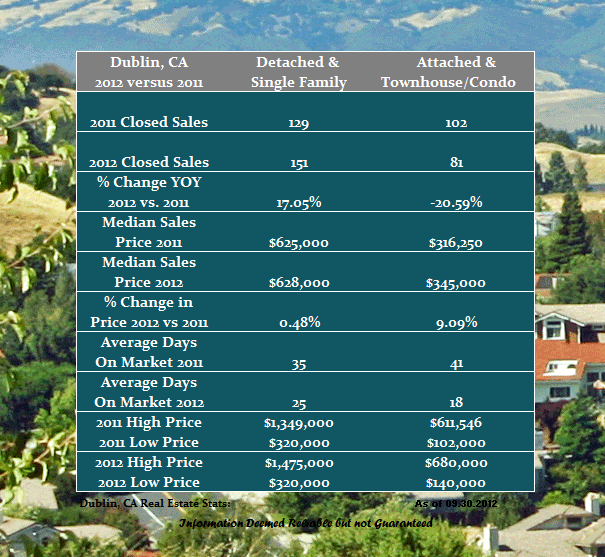 The chart below addresses how the Dublin real estate market did in the summer of 2012 versus 2011. One can see that the Single Family Home market posted a nice increase in the number of homes sold, a slight rise in median values and a pretty dramatic drop in the number of days it took to get a home into escrow. That was also the case for the Attached Home segment where the increase in price was almost 10% but there was a lower number of units sold. This is part is due to the very low inventory of homes for sale up and down the 680 Corridor. Have Questions About Buying or Selling in the Dublin Market?? ?…Give Me A Call! Share the post "Fall is well underway…How did Dublin Real Estate Perform this Summer?"